The number of newly developed biologic drugs is growing faster than conventional pharmaceuticals by twofold. Biologics have a higher regulatory approval rate when compared to traditional, chemically manufactured, small-molecule drugs and evidence tangible clinical performance results with better efficacy. Biologics now represent an increasing share of the drugs used to treat life-threating illnesses. One product within this classification, vaccines, saves over 5 million lives each year and is a compelling and cost effective way to prevent diseases. The global vaccine market registered revenues of $21 billion in 2008 and was valued at $52 billion in 2016. It’s one of the fastest growing biopharmaceutical sectors. Protecting biological materials in the laboratory is essential to prevent the destruction of their molecules and maintain their viability. Vaccines are usually comprised of one or more active ingredients responsible for generating an immunogenic response in a patient. In the vaccine production environment, it’s highly likely to experience potency-loss of the active ingredient in the product if it’s kept at room temperature for as little as a few hours. Consequently, it’s essential to maintain the required storage temperature of the vaccine throughout the research, production and administration life cycle in order to keep the vaccine’s active ingredients efficacious. The Centers for Disease Control and Prevention (CDC) aim to provide knowledge on the importance of proper storage of vaccines. They emphasize that storing these products at a consistently low temperature (desired set point) is critical because failure to do so triggers the loss of strength and effectiveness of these products which not only discredits research results but can impact patient safety. Hundreds of thousands of vaccines are disposed of each year because of improper cold storage conditions, amounting to millions of dollars lost. The CDC also recommends temperature mapping of storage units to avoid unwarranted temperature deviations. They state that thermometers used to monitor vaccine temperature should be digital, and also recommend a remote monitoring system. 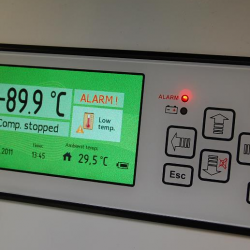 The best laboratory freezers have built-in microprocessor controllers with a digital display. They also use an integrated temperature sensor to avoid accidentally triggering alarms caused by routine door opening, by recognizing the uniform internal air temperature where samples are being stored with heightened precision. The Joint Commission, a nonprofit that accredits and certifies around 21,000 healthcare organizations in the US, also requires that the performance of equipment storing medication be monitored. They assert that facilities must data log temperature and note any changes from the required ranges when storing drugs. Arctiko, a Danish manufacturer of ultra-low freezers, has created a multidimensional level of security for your products and samples. Arctiko freezers feature multiple alarm options including remote alarms such as door opening, probe failure, power failure and temperature fluctuation (with isolated issue displayed on the digital screen to save you from troubleshooting or guessing). Unique to the Arctiko freezer is a compressor failure alarm, which notifies you immediately if there’s a problem, versus others on the market that will only alert you of the issue once the freezer temperature reaches the warm set point (i.e. -60°C, by which point your substances may already be damaged or compromised). The CDC also recommends that drawers used to store biological substances be easily removable, without destabilizing the product being extracted or the contents remaining within the freezer. This protects biosamples from temperature-related problems. 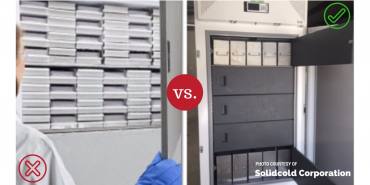 In a recent article by Mark DuFloth, of Solidcold Corp. (CA), some engineering issues of leading ULT freezer manufacturers were highlighted. Certain claims by these manufacturers that address their product’s ability to fit hundreds of boxes into their freezers fail to mention that by doing so, the cooling system is compromised by inadequately absorbing their latent heat. Furthermore, units packed to the brim prevent air from properly circulating which causes thermal pockets that can damage your stored contents. 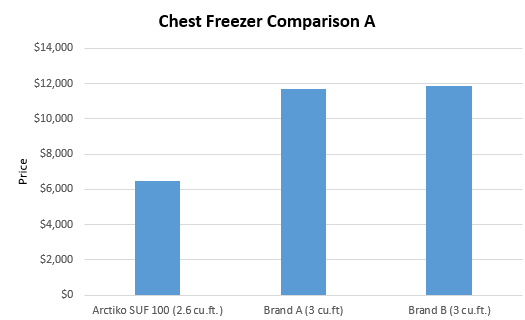 Biological product freezers can be kept full but should never be overcrowded. Not only does overcrowding make it difficult for the laboratory employee to remove and replace racks into the freezer, but the center of the freezer can then take several hours to reach -80 °C (if it does at all). Arctiko freezers are engineered to provide more space for racks without compromising their ability to cool samples. Each of the shelves in their upright models features a system that directly cools each shelf for better temperature uniformity, and 80% better cooling performance when compared to the leading manufacturer, in an independent study conducted by Solidcold Corp., independently of Arctiko A/S. Arctiko’s single compressor system is patented worldwide and uses only one compressor and one cooling cycle. This means less heat dissipation and reduced noise. Traditional cascade systems have a higher failure rate, require two compressors (both of which must always be working in order to avoid a system failure. Ultimately, they have a shorter lifespan and require more complicated maintenance and more replacement of parts when something goes wrong. All of this can add up to a costly dilemma. Of course, in the real world, laboratory staff are opening and closing the freezer door 3 to 4 times per day or more, so an inferior competitor unit could not adequately hold the -86°C temperature during a normal day’s operation and consequently the materials contained in the freezer are not going to be stored at the essential temperature. What would happen to your samples in the event of a power failure? Your biosamples and products, along with years of hard research, could be ruined by becoming ineffectual. 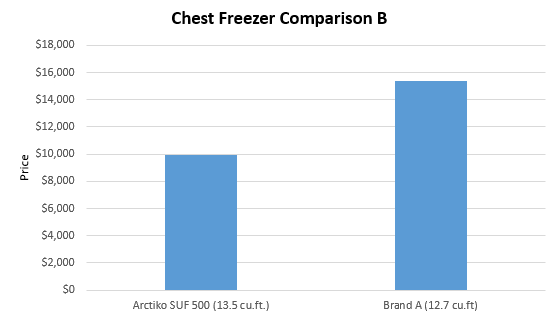 Arctiko’s freezer range also features units with dual cooling systems for enhanced security measures. 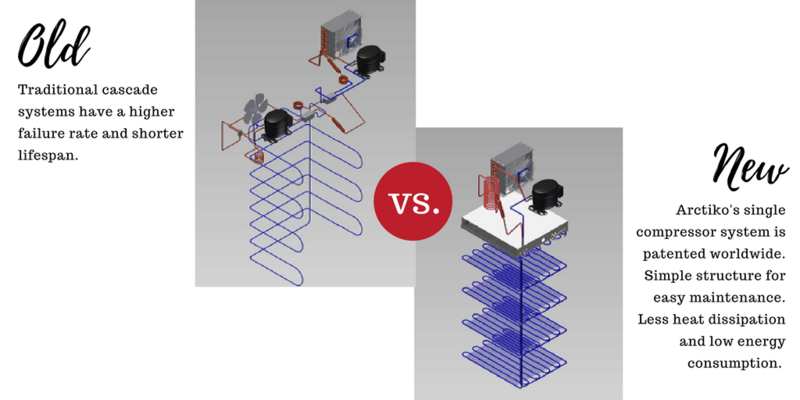 Two independent single compressor cooling systems work simultaneously to maintain their ultra-low temperature. In the event of any failure related to one of the cooling systems, the other system will continue to maintain -86°C until the problem is solved. If you’re not using a freezer with a dual cooling refrigeration system, be sure to have an agile plan in place that would allow you to quickly and easily relocate your samples. If you’re considering moving into a new research lab or opening an additional facility and don’t yet know the capacity or quantity of samples you’ll be storing long-term, consider an ultra-low freezer with multiple compartments that function with individual compressors. Arctiko’s ULUF 850 features two compartments with a capacity of 29.2 cu.ft. to offer you the benefit of running one compartment at -86°C, whilst keeping the other one turned off (attainable by managing the controller connected to that isolated compartment), until you actually need it. A true leader in innovation, Arctiko have also engineered the ULUF 850 to be capable of operating each compartment at disassociated temperatures, so when you are ready to store samples in the second compartment, you’ll be able to do so at the required temperature without any mechanical challenges. The ability to utilize a spare compartment may also beneficial during a freezer defrost process, where samples have to be relocated. Because any fluctuation in storage temperature can impact the biological integrity of your samples, having a backup freezer compartment available to operate at the required temperature during that period of time will help sustain your analytical or research goals. Whether you’re preparing for the future – or temporarily relocating samples – the convenience of having equipment already in place to support these needs is invaluable. The poor and inadequate storage of biological products amounts to millions of lost dollars each year and leads to not only the burdensome task of replacing the lost materials, but in the case of vaccines, the additional revaccination of those patients who were dispensed a damaged product. All of these things will be key to keeping your biological products safe and preserving years’ worth of research. Outdated, deteriorating lab freezers that neglect to properly log data and provide sufficient alarm security are a significant barrier to successful outcomes for treating patient illnesses and disease using biologic drugs. Reliable lab freezers that are designed and engineered with innovative technology that meets or surpass FDA and CDC requirements for proper vaccine storage is critical for reducing the risk of a compromised study, sample or finished product. Biological materials have sensitive, unique, temperature storage needs, so ensure you’re familiar with all the crucial details when making your ultra-low freezer selections.